This spring, as many in Tribeca have noticed, the park bloomed with an especially exuberant array of yellow, red, purple, pink and blue hues of thousands of flowers. Monica Forrestall, a member of the Friends of Washington Market Park’s board of directors and the volunteer who manages the community garden, tells how this spring display came to be and about its master planner, NYC Parks Department gardener Richard Haugland. If there seem to be a lot of flowers in Washington Market Park this year, well, there are. This is what 40,000 bulbs look like in bloom. That’s three times more than have been planted in our park for many years. 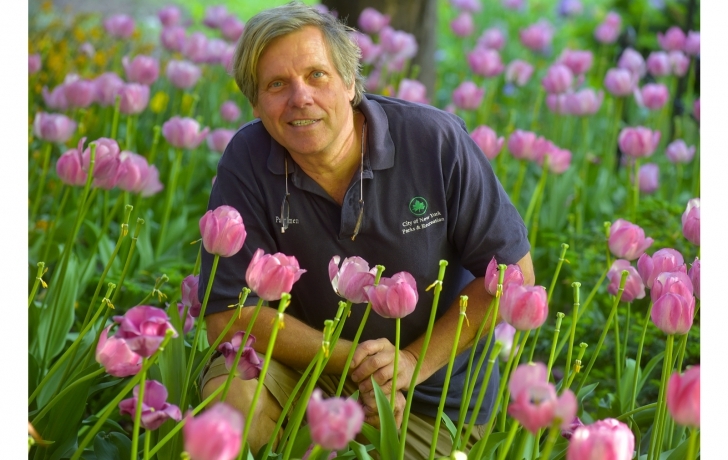 But luckily for us, our new park gardener, Richard Haugland, happens to love bulbs. Richard has a degree in horticulture studies with a minor in botany from Ford­ham, as well as a certificate from the Brooklyn Botanical Gardens. He’s been putting his expertise to use in the city’s parks system for 16 years, beginning at Union Square (pre-renovation) and most recently at City Hall Park, where he was acknowledged for his gardening work with a proclamation from Mayor Mich­ael Bloomberg. “The result was that everything came out at the same time,” he said. Red, yellow and purple tulips and tall exotic Yellow Crown Imperial Fritillaria (never planted in the park before) filled beds along the entryway path as well as in the bed separating the path from our community garden. Noted lovelies in the park have been the lilac-colored “Peony” tulips, and the very tall varieties, such as the purple “Lily” tulips and a multitude of shades of pink ones against the wall of the Borough of Manhattan Community College ramp. Richard has a master plan that in­cludes every area of the park: brightly colored flowers by the toddler play equipment and sandbox; a more subdued and sophisticated palette of blue and white grape hyacinths and fragrant or­chid-style thalia daffodils for under the trees and the beds winding around to the gazebo. He did have some help in making the park look great from groups of children at kids planting events that I help organize, as well as some local schools, several members of the Washington Market Park board, the park’s manager, Stephen Becchino, and the entire park staff. The park’s flower show is far from over. Richard carefully plans the plantings so there is a continuous show of new blooms. The vibrant flowering azalea bushes are just beginning to bloom, and the astonishingly tall Gladiator Alliums are opening. The pretty and fragrant peony flowering bushes are starting to open up as are different rose bushes around the park. Still to come are other summer flowering bushes, such as the 50 variegated lace-capped hydrangea and begonias that we planted last month at our annual It’s My Park Day for children and middle schoolers. It’s an event that I head up on behalf of the park board, under Richard’s watchful eye. Stop by and take in the unfolding flower show!